It’s estimated that people gain a few pounds during the holidays, thanks to the endless parties and seasonal treats. Plus, this is Louisiana so you know the cuisine is going to be over-the-top special, which makes us further at risk. To keep those pounds at bay, health advocates insist people exercise – which, I’ll admit, is not my favorite thing to do. So, when fun exercise options pop up, I take notice. This month – and usually every month – several Louisiana art museums offer healthy ways to get fit inside beautiful surroundings. Take the New Orleans Museum of Art, for instance. Every Saturday morning and Monday evenings, in collaboration with the East Jefferson Wellness Center, the museum offers yoga and Tai Chi. Saturday yoga classes begin at 8 a.m. either in the Besthoff Sculpture Garden, if weather permits, or within the museum’s permanent collection. At 6 p.m. Mondays, East Jefferson Wellness Center instructor Terry Rappold leads Tai Chi classes in various art galleries. Classes are $5 or free for NOMA members and East Jefferson Wellness Center members. The Alexandria Museum of Art teams up with Rapides Regional Medical Center for Saturday morning Qi Gong classes at 10:30 a.m. Saturdays, Yoga for Kids at 10:30 a.m. every second Saturday of the Month (Dec. 8 this month) and Yoga in the Gallery at 5:45 p.m. Tuesdays. For more information, visit themuseum.org. For an updated listing of events happening at the museum, visit their Facebook page. 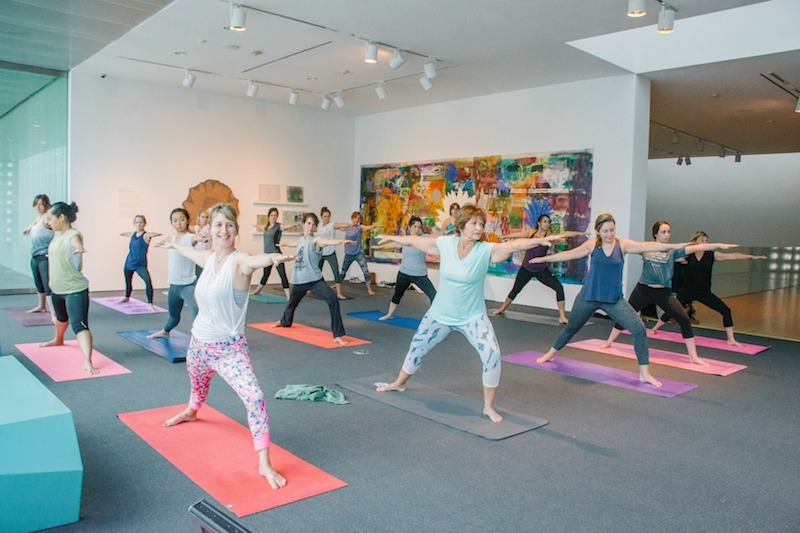 In Lafayette, yoga classes led by a certified instructor are offered at 11 a.m. on the second Saturday of each month (Dec. 8 this month) at the Paul and Lulu Hilliard University Art Museum on the University of Louisiana at Lafayette campus. Best of all, the classes are free, thanks to sponsorship by Blue Cross and Blue Shield of Louisiana, so there’s no excuse to work off those calories. And sometimes the classes are offered in French. For new mothers, a gentle yoga class is offered at the R.W. Norton Art Gallery in Shreveport. The Mommy and Me Yoga class led by Little You Yoga is held at 10 a.m. the first and third Thursdays of the month (Dec. 6 this month). For more information, visit rwnaf.org/events.